In a time when Shadowhunters are barely winning the fight against the forces of darkness, one battle will change the course of history forever. Welcome to the Infernal Devices trilogy, a stunning and dangerous prequel to the New York Times bestselling Mortal Instruments series . Equipped with a magical army of unstoppable clockwork creatures, the Club is out to rule the British Empire, and only Tessa and her allies can stop them…. I think I enjoyed Clockwork Angel more the second reading than the first. 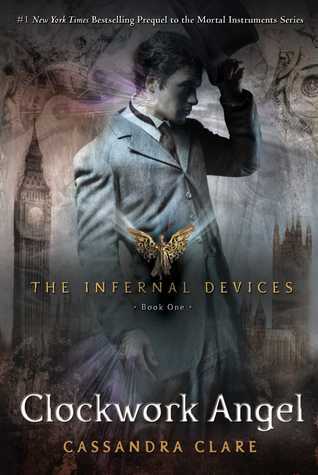 I must also confess that I enjoy The Infernal Devices more than The Mortal Instruments. I think the characters are stronger and the world is better put together. There is a strong formulaic feel, but I ignored it the second time around. Much like Clary, Tessa had no clue about the Shadow World or her abilities. The situation works well for both series in its own way. Tessa learns she is a shape shifter She quickly blossoms from timid girl to a fierce young woman. As an anomaly in Downworld, it was interesting to see Tessa navigate the precarious world of Shadowhunters and Downworlders. The looming threat of the Magister didn’t help matters any. From the get go, I loved Jem the most of the two boys. My love only increased during the second reading. Jem is kind, quiet, and determined. Not to mention a musician. *swoon* He could come off as a tragic figure with his condition, but he is still a strong and talented Shadowhunter. Will is well, Will. Very much like Jace, he has a devil may care attitude. I don’t blame him for the way he is, but it does get a bit grating at times. A bit like Jace! Haha. The secondary case of characters are just as strong and well developed as the main characters. My favourite is Sophie. While chock full of action, there is less action than The Mortal Instruments. I am perfectly okay with that because there is more focus on character development. I love that Magnus is back and just as fantastic. I love Magnus! I believe is a stronger presence/character in The Infernal Devices though. On the second reading, plus having finished the trilogy, things make more sense and fit together perfectly. Love or hate her, Cassie Clare can weave an incredible story!